Just starting harp lessons and don't want to buy a harp right away? Renting a harp now, but wish your payments were going towards the purchase of a harp? The Harp Connection's Lever Harp Rental Program features both Classic and Celtic Lever Harps for rent nationwide. This program lets you limit your investment while you try one of our instruments. 100% of your first four months rent can be applied towards the purchase price. Choosing a harp is never easy - that's why we have the best instruments from Lyon & Healy and Dusty Strings available for rent. Prices range from $50 to $80 per month, with a minimum four month rental commitment (payable in advance). Security deposit and credit approval required. • Return the harp. Please contact the office to make an appointment for the return or to schedule a pick up by the shipping company. Rentals are limited to available stock. Please inquire if you have interest in a particular model or finish. On occasion we have previously owned or rented lever harps. These instruments are also available for rent, and as always they have undergone a thorough evaluation and must meet or exceed our strict standards of quality before they are released. If you need the harp to be shipped to you, no problem, we ship anywhere in the United States. If you decide to purchase the harp after rental, you pay no additional shipping. For purchases, financing can be arranged upon credit approval. Please call us at (888) 287-4277 if you are interested in renting one of our harps. Or, you can download and print out our Lever Harp Rental and Financing Application and sign up by fax. Our fax number is (978) 744-5399. The Rental Application includes lots of valuable information, including how to receive and inspect your harp if it is shipped to you. Better yet, would you like a customized copy of our Rental and Financing Application you can fill out electronically? Just send us your full legal name by email and we will send you a link to your personalized on-line Rental Application! Our Lever Rental Price List provides rate and security deposit requirements for all our lever harp models. *We work really hard to keep the prices on our web site as up-to-date as possible. 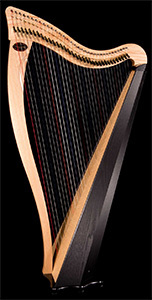 Some of our harps come with special finishes, decorations or additional levers and are priced accordingly. We occasionally have "slightly used" harps for somewhat less. All prices are subject to change without notice; call us and we'll be happy to quote you current prices and finish availability on all our harps.